Lectio: Having asked for the grace to hear God's word, read the passage twice. 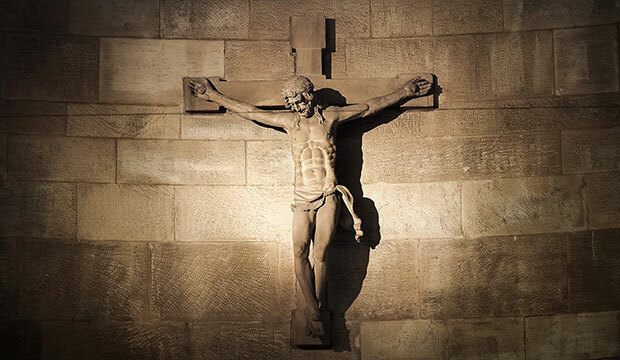 Rather, he emptied himself, taking the form of a slave, coming in human likeness; and found human in appearance, he humbled himself, becoming obedient to death, even death on a cross. Because of this, God greatly exalted him and bestowed on him the name that is above every name, that at the name of Jesus every knee should bend of those in heaven and on earth and under the earth, and every tongue confess that Jesus Christ is Lord, to the glory of God the Father. The great hymn in Philippians is the earliest recorded hymn of the Christian faith. I love this hymn because of a specific word that is used, “exalted.” In the hymn, it states that Jesus “humbled himself, becoming obedient to death, even death on a cross. Because of this God greatly exalted him.” Because of Jesus’ humility, God raised Jesus up from this lowered state. In today’s feast, we celebrate the triumph of the Cross of Christ, we lift Him high in victory and in worship. When we sing “Lift High the Cross,” we are singing in worship of Him and his triumph. For us to exalt Him, to raise Him up above our heads, is an act of worship. But for Jesus to be raised by the Father means something completely different, for God does not raise Jesus above Him, but to Him, as his Son. Both for the ancient church and for us today, this hymn from Philippians is proclaimed in the context of the Mass. This context is important because in the encounter of the Mass, we are reminded of our humanity but also of the transcendence of the godhead. To put it another way, we are reminded that we are not God and that we belong to Him. In the very raising of Jesus, above our heads in triumph, which incidentally the cross-bearer does at the beginning and end of every Mass, we affirm these same truths: That He is God. That we are not. That He is triumphant in his cross and resurrection. That we belong to Him. And this is the God whom we worship. These are jarring and life-changing truths. 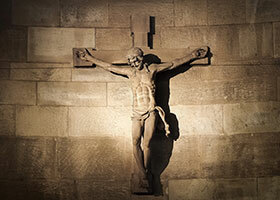 I invite you consider these truths anew with me today as the Church celebrates her Lord’s victory on the sacred wood of the cross, calling to mind the true and living God to whom we all belong. Callie Nowlin, MTS, is a convert turned Latin teacher, catechist, and blogger with a passion for Scripture and helping others on their journey toward Christ. The great hymn in Philippians is the earliest recorded hymn of the Christian faith. I love this hymn because of a specific word that is used, “exalted.” In the hymn, it states that Jesus “humbled himself, becoming obedient to death, even death on a cross.